A variety of GoPro mounts are also available to borrow. See a full list and check availability. The loan period is 5 days. Limit one camera per student. 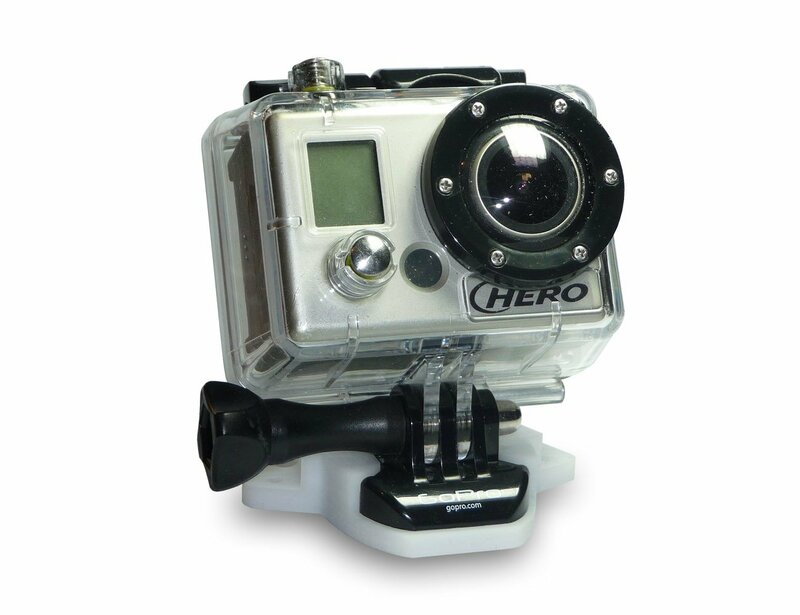 You may check out the GoPro camera for a second time in person, at the Front Desk. The borrower agrees to return the GoPro camera and accessories in the same condition as when received. If equipment is damaged or lost while on loan, borrower agrees to reimburse the Academy for the full replacement cost of camera or accessories, up to the full replacement cost of $370. Overdue charge is a flat fee of $25.00. Borrowers will be billed for the full replacement cost of $370 after third day overdue. You are responsible for the GoPro camera checked out to you. Do not leave it unattended. Transfer any files you wish to keep to your own memory device. All files are deleted from the camera upon return. Press the Power/Mode button to turn on. The red light at the front of the camera will flash three times and the front display will turn on. Press and hold the Power/Mode button to turn off. The red light at the front of the camera will flash several times and the front display will go blank. The top left corner is the icon for the camera mode. It will either show a video camera (video mode), a still camera (picture mode), a camera with a clock (time lapse mode), or several overlapping rectangles (photo burst mode). The letter next to the camera mode icon tells you whether you are shooting Wide Format (16:9 ratio), Medium Format, or Narrow Format. The bottom left corner tells you the amount of time remaining for video (if in video mode) or the number of pictures remaining (if in camera mode). Amount of video or picture space on the memory card depends on the size of the card and the resolution (size) of the files you are taking. The GoPro 3+ has Wi-Fi capabilities that allow you to pair the camera with an app on your smartphone or tablet. The allows you to start/stop filming, take pictures, and control settings and modes from the app instead of on-camera, letting you control the camera from afar. You can also use the app as a viewfinder for the camera - it lets you see what the camera sees from the app. Watch the video tutorial below to see what it's capable of. The app is free. Just download and connect. Turn the camera on and press the Wi-Fi button on the narrow edge of the GoPro camera. The blue light on the front of the camera will turn on. Press the Wi-Fi button twice, then the Capture/Select button (on top of fthe camera). This will take you to the Wi-Fi menu. Use the Power/Mode button (front of camera) to cycle through options until you get to GoPro App, then hit the Capture/Select button (top). Open the GoPro App on your smartphone/tablet. To turn the Wi-Fi on the GoPro off again (it saves on the battery life), press and hold the Wi-Fi button until the blue light blinks and turns off.